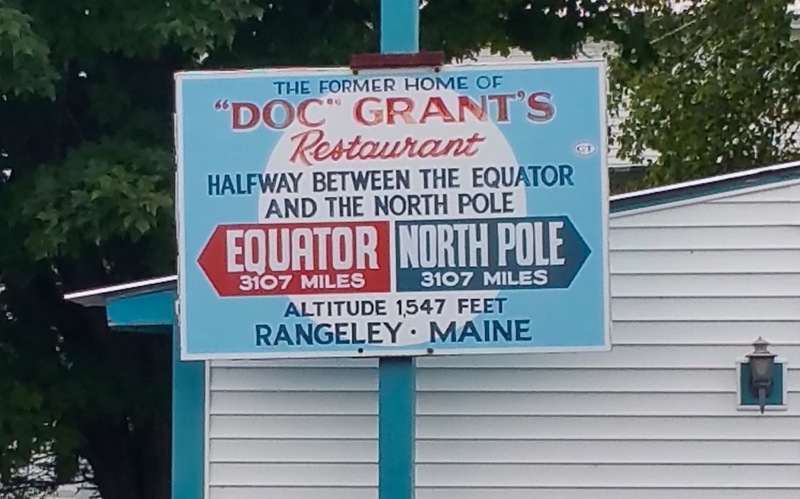 Last month we visited beautiful Rangeley, Maine, home to Saddleback Mountain. 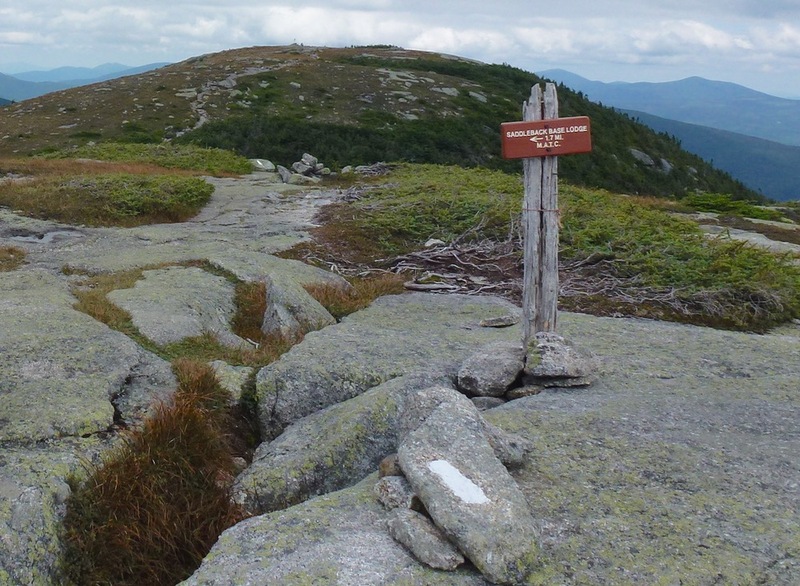 The area is also known as the High Peaks region and has eight of Maine’s fourteen 4000-foot peaks. We rented a cabin at Hunters Cove on Rangeley Lake. 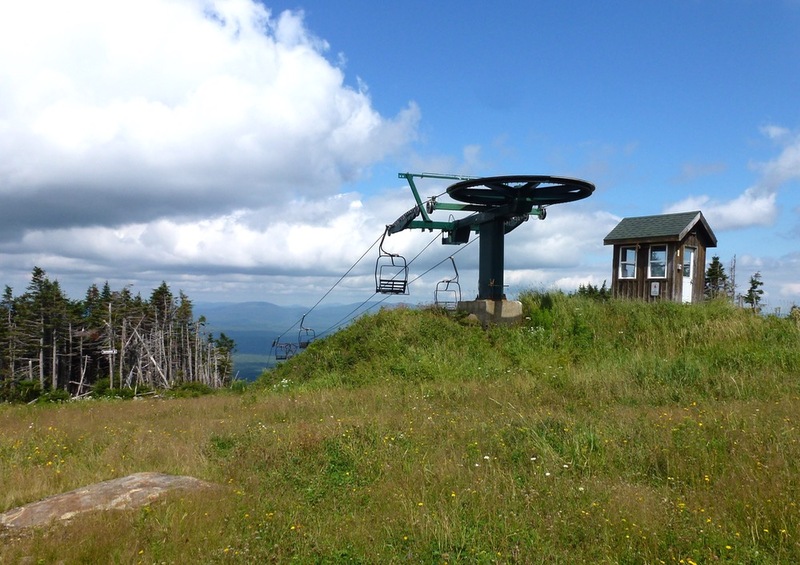 The Saddleback Mountain base lodge is eight miles from Rangeley’s main street and sits at 2400 feet. 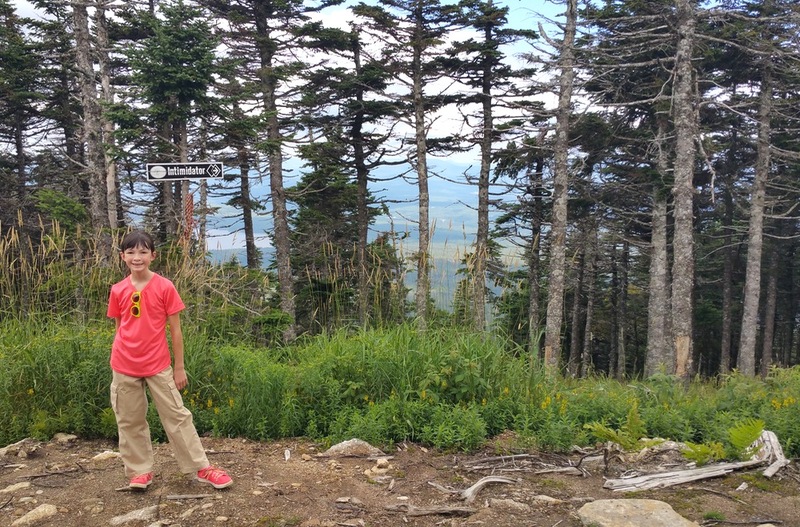 There are two ways up the mountain, 5.1 miles on the Appalachian Trail or two miles up the main face of the ski area. We chose the ski trail. 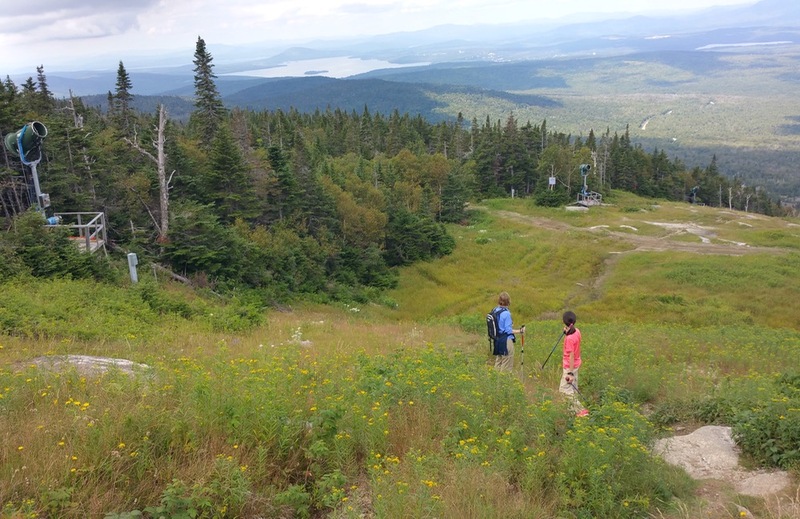 The hike starts at the beautiful base lodge and follows the green-rated Wheeler and the blue-rated Gray Ghost to the top of the Rangeley Double. We continued up the Tri Color to the top of the Kennebago Quad. There is a short, narrow trail to the summit from just above the quad. When we arrived at the Lodge there were only a few cars in the lot. There was a Sunday Brunch available in the Lodge with only a few people in the dining room. We started up the well-marked route and were moving at a decent pace until we hit Gray Ghost. Gray Ghost is a typical blue trail with alternating steeps and flats. It is also one of the Saddleback race trails. The steep sections took a lot of effort and energy. One thing we love about hiking a ski trail are the open views. Taking a breather allows you to take in the amazing mountains and lakes that surround the ski area. The pictures really don’t capture to the view. At the top of Gray Ghost we switched to Tri Color, a much easier trail to hike. The temperature was dropping and the variable cloud cover kept the hot sun off us. We could see both rain and sunny in the distance during the entire climb. This weather pattern stayed with us all week. When we arrived at the top of the ski area we began to smell an intense and refreshing balsam fragrance. The top section of Saddleback is all black diamond trails and glades. It looked steep. We continued up the narrow trail above the quad and within a few minutes we were at the 4120 ft summit. There was a nice steady breeze and we had 360 degree views. We could see Sugarloaf off to the northeast, only 11 miles away. Saddleback is currently not planning to opening this winter. 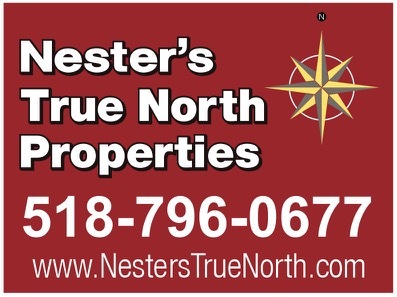 The current owners, the Berry Family, have had the ski area on the market for a few years now. They report putting $40 million into the area including a $13 million renovation of the base lodge. The Rangeley Double Chair creates a huge bottleneck on the mountain and needs an upgrade. The Berrys have indicated they won’t open this season if they’re unable to get the $3 million needed to upgrade the chair or find a buyer willing to take over the operation. Saddleback has employed 250-300 people in previous seasons. The potential loss of these jobs would likely be devastating to Rangeley and the surrounding towns. We heard some grumbling from those we spoke to regarding how things are run at Saddleback. Many feel the base lodge renovation was a bad move and the funds would have been better spent on the needed replacement lift. From what we saw the mountain is a gem with real potential and we’d hate to see it added to the rolls of NELSAP. Saddleback is in an amazing area too. What a special mountain and we agree, we would hate for this place to close its doors and added to that NELSAP list. We hope to move to Maine one day… One day soon. Ugh, I hope they don’t go NELSAP, I’ve skied there once, only the lower mountain was open. I tried to ski there again, it was so windy they didn’t open at all. Beautiful area, great views from the warm up building at the top of the Rangeley chair.